The iPhone 8 is now available for pre-order in Malaysia and you can get it on contract from the big 4 telcos – Celcom, Digi, Maxis and U Mobile. Overall, the iPhone 8 costs more than last year’s iPhone 7. The base model starts from RM3,649 and it comes with 64GB of storage. If you plan to buy it with substantial subsidies, getting it on contract is probably the best way to go. 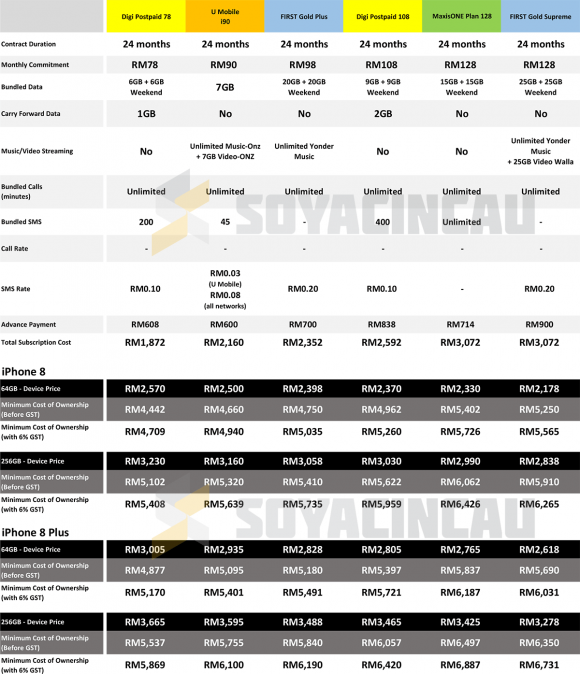 So which telco should you go for? We’ve compared all the iPhone 8 plans for your easy reference. Before committing to a contract, we recommend that you pick a plan that would suit your needs. Higher commitment plans would offer a lower device price, but if you don’t plan on using so much data, it would be quite wasteful in the long run. We would advise you to get a plan that works within your monthly budget. You can also study your current bill and data usage to determine which plan is more worthwhile. 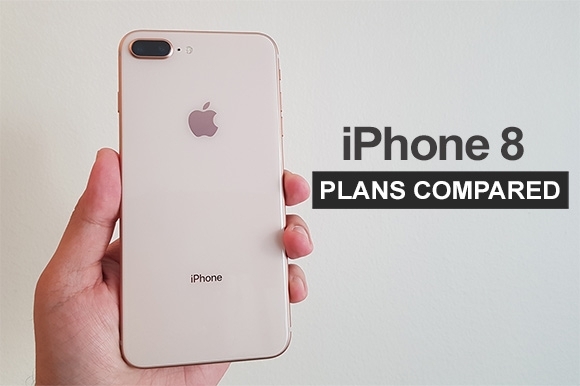 For the iPhone 8 and 8 Plus, there are a total of 12 plans available. 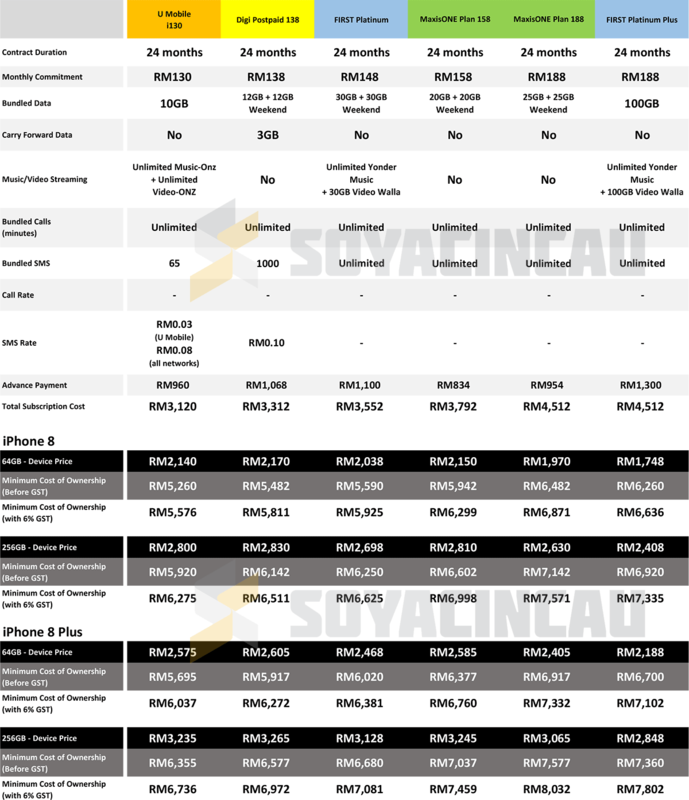 Celcom has the most option with 4 plans while Maxis and Digi has a total of 3 plans each. Surprisingly, U Mobile offers just two plan options this time round. Below is the list of plans available sorted by their monthly subscription fee. Towards the bottom of the table, you’ll find the price of the device and the minimum total cost of ownerships which is inclusive of device price and subscription fee for 24 months. If you’re looking for the lowest cost of ownership, Digi Postpaid 78 is the most affordable since it has the lowest monthly commitment fee. For those looking for the most data for your buck, Celcom is the most generous across all price range. The blue telco is the only one offering more than 20GB of data for less than RM120/month. If you love streaming videos such as YouTube, iflix and Netflix non-stop, it is worth pointing out that U Mobile’s i130 plan gives you unlimited social and unlimited video streaming across popular platforms. Of course, there are other things to consider which isn’t illustrated on the table above. As usual, coverage and quality of service might vary depending on telco and location. So, ideally you would pick a telco that performs well at your desired location. Don’t want to be tied down to contracts? You can always purchase the iPhone 8 outright from authorised retailers nationwide beginning 20 October. Some of them are offering pre-orders too with the option of free delivery of self-pickup for this Friday.